Two worlds apart or one united? : About Yiddish in New York. Yiddish is a very old language with a rich history. Several languages have adopted Yiddish words, and you will find quite a few Yiddish words in New York English. There are many Yiddish speakers in New York City and they fall into two groups. Why so? And how do they maintain the use of the language given the dominance of the English language? Yakov Blum explained all that in his talk at the Polyglot Conference in New York City. Ashkenazim is an ethnic subgroup of the Jewish people. They began to coalesce in Central Europe about 1000 years ago. Incidentally, Ashkenaz was once the Hebrew word for Germany. In the 11th c. Ashkenazim composed 3% of the world’s Jews but by 1931 they counted for 92% of all Jews in the world. Traditional: All Ashkenazim today can trace their ancestry to Yiddish-speaking Jews, but due to the linguistic shift and the Holocaust, Yiddish is a minority language among ethnically Ashkenazi Jews today. Vernacular: Ashkenazi Jews also spoke Hebrew and Aramaic but these languages were restricted to written and formulaic use. Yiddish was spoken and read by everyone, and this is the reason that in the definition above it is called “vernacular.” Between the 16th and 19th century, Yiddish was widely spoken in Europe - the second language after Russian. A Jew could travel all around Europe and never had to switch languages. Yiddish is a High Germanic language, but it has major semitic and slavic components. It looks like a mixture of Hebrew, German, and a Slavic language, but the way words or endings combine is not predictable because you can’t just take a Hebrew noun and a German verb to form a Yiddish sentence. Another characteristic of Yiddish is that because it’s been influenced by all these languages, words that denote the same element have been adopted by Yiddish and have different definitions. For example, the word seyfer (book in Hebrew) and bukh (book in German) are used differently: the first one is used for books about the Jewish religious life while bukh is used for all other topics. In the 19th century, advances in ship technology and the promise of economic opportunities led to a massive immigration of Jews to America, followed by greater immigration towards the end of the century because of targeted violence against Jews in Eastern Europe. More than two and a half million Jews came to America, half of which lived in New York. In 1924 this mass immigration ended abruptly due to the passage of the national origins act, which was put in place specifically to curb the immigration of Eastern European Jews to the U.S. Today, the Yiddish community in New York is the biggest community of Yiddish speakers in the world. 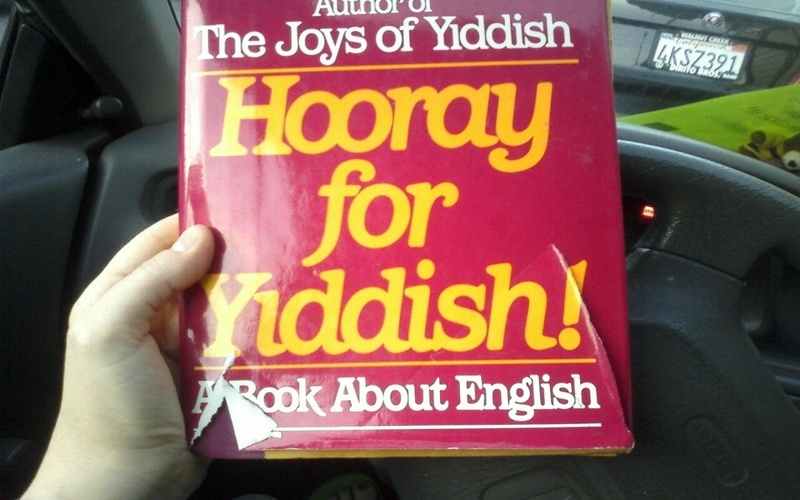 Yiddish is the 8th most spoken language in New York state. However, those Jews who came to New York in the 19th and early 20th century have followed the example of other immigrants and speak English. The same holds true for those who immigrated after WWII. So, who are those Yiddish speakers in New York today? Most are 2nd, 3rd, and 4th generation Americans. But the dominance of Yiddish among them shows no sign of diminishing. How is that? This is attributed to a single individual; Rabbi Yoel Teitelbaum. Years before Teitelbaum, Jews in Europe were living in enclaves, following their own rules of dress, names, literature, language etc. and there was no way to join non-Jewish communities. At the end of 18th c. a great number of Jews abandoned the traditional life while a small number opposed to that, especially the Haredi group, part of which was the Hasidim group, and Teitelbaum was one of their rabbi. He first established a community in Transylvania, which perished during the war. In 1947 he came to America, settled down in Brooklyn, and set out to re-establish the community with members of other Hasidic groups from Europe. He established a society, first in Brooklyn and then in Kiryas Joel, in which people lived without outside cultural influences. Even today, they have their own schools, stores, media, and music. Consumption of outside media is discouraged and TV is forbidden. The community of Kiryas Joel also has interesting demographics - there are typically more children than the average American household, and most of the population are under the age of 14. And every 15 to 20 years, the population doubles. The other Yiddish speaking group is the Yiddishists. Nathan Birnbaum coined the term over a century ago, the same person who coined the term Zionism. Yiddishists are a linguistic community and use the language by choice, regularly, even when they can communicate in a different language. They may do it for social reasons, ideological reasons, or for the intellectual challenge. The community is far less geographically concentrated and most Yiddishists learned the language as adults. There are schools and meetings every summer, in New York and in Europe, like the Uriel Weinreich and the Yiddish Vokh (Week), where young people from outside the Hasidic world learn Yiddish. There is also the Yiddish Farm in Upstate New York - which was built with the goal of being a place where Yiddish is spoken all year round - and not just here and there - and where something beyond the language itself would serve to bring people together. From the start, it was designed as a place that would bring both groups together. In recent years, the two groups have become closer, due to the Internet, which has increased the interest of Hasidim to the outside world. The relation between the two groups is not ideal, but the farm is a place for these two groups to meet, interact, and hopefully gain deeper community kinship from the encounter. Check out Yakov Blums' whole Yiddish talk here, and try your hand at learning Yiddish for free, courtesy of Mango Languages.